The Best Civil Engineering blogs from thousands of top Civil Engineering blogs in our index using search and social metrics. Data will be refreshed once a week. 2.38 Mason and Stanfield, Inc.
Civil Engineering newsletter is a comprehensive summary of the day's most important blog posts and news articles from the best Civil Engineering websites on the web, and delivered to your email inbox each morning. To subscribe, simply provide us with your email address. About Blog Civilax.com is designed for Civil Engineering Professionals, Undergraduates to update them selves with latest versions of civil engineering software, E-books, software training videos & Manuals. Facebook fans 83,634. Twitter followers 667. About Blog The Constructor is a valuable informational resource for civil engineers, related professionals, and students. Information, Articles and Guides are categorized into sections. Practical Guide deals with testing methods and practical applications at site. Facebook fans 451,154. Twitter followers 1,662. Facebook fans 16,616. Twitter followers 48,973. Reston, VA About Blog ASCE is dedicated to the advancement of the individual civil engineer and the advancement of the science and profession of civil engineering through education. ASCE represents more than 150,000 civil engineers worldwide dedicated to designing & building infrastructure that protects the public health, safety, & welfare. Facebook fans 342,482. Twitter followers 41,305. About Blog The biggest civil engineering portal on the internet. This site is made for educational purpose so as to help the fellow civil engineering students and to spread the knowledge about the latest civil engineering projects and softwares. Facebook fans 21,374. Twitter followers 27. Fayetteville, AR About Blog Civil Structural Engineering is a home of the magazine and website for all your civil and structural engineering news, stories, updates, and education. Facebook fans 23,431. Twitter followers 1,924. San Francisco, CA About Blog Discussion and articles about Civil engineering: Building and maintaining the infrastructure. Facebook fans 1,178,167. Twitter followers 537,012. Chicago About Blog The Council on Tall Buildings and Urban Habitat is the world's leading resource on tall buildings for architects, engineers, and builders of future cities. The Council’s mission is to disseminate multi-disciplinary information on tall buildings and sustainable urban environments, to maximize the international interaction of professionals involved in creating the built environment. Facebook fans 8,803. Twitter followers 4,664. Cincinnati, OH About Blog ConstructConnect is a connector—bringing general contractors, subcontractors and building product manufacturers together throughout North America with the most complete, accurate and actionable construction data in the markets in which they work. Get access to bidding commercial construction projects and information with ConstructConnect. Facebook fans 923. Twitter followers 48,571. India About Blog Online Civil website for civil students and civil engineer's free to download software,ebooks,tutorial,journals,structural designs etc. Facebook fans 1,977,716. Twitter followers 1,953. Hyderabad, India About Blog The Civil Engineering Blog. Civil Read is a learning platform for all the Civil Engineers and Civil Engineering Students around the world. Our mission is to educate and keep people informed by creating a trusted source of knowledge in Civil technology and basics everything related to Civil Engineering. Chennai, India About Blog The Masterbuilder is India's leading Civil Engineering, Construction News, Construction Magazine. Nobody covers India's Civil Engineering industry better! Facebook fans 2,333. Twitter followers 828. Ireland About Blog With almost 24,000 members, Engineers Ireland is one of the country's oldest and largest professional bodies. Our primary role is to be the representative voice of the engineering profession in Ireland. Facebook fans 7,565. Twitter followers 11,257. About Blog The main purpose of this blog is to provide civil engineering information to other Civil Engineers in taking their carrier to the next level and helping them. This website contains information related to the field of civil engineering. Facebook fans 13,180. Twitter followers n/a. About Blog Daily Civil is a learning platform for all the Civil Engineers and CE Students around the world. We have started this blog with a mission to educate and keep people informed by creating a trusted source of knowledge everything related to Civil Engineering. Facebook fans 111,686. Twitter followers 483. London About Blog New Civil Engineer (NCE) for breaking civil engineering news, analysis, opinion and jobs. Facebook fans n/a. Twitter followers 28,913. Richmond, VA About Blog Timmons Group was founded in downtown Richmond in 1953 as a surveying and engineering company. The firm provides civil engineering, environmental, GIS/geospatial technology, landscape architecture and surveying services to a diverse client base. Facebook fans 697. Twitter followers 1,572. About Blog This site is for all fresh civil engineers to gain practical knowledge related to civil engineering in the form of Articles and posts. Facebook fans 21,374. Twitter followers n/a. About Blog India’s largest educational resources gallery exclusively for Engineers. This website is authored and maintained by Mukesh Sah, He is a B.Tech in Civil Engineering and the founder of LearningTechnology.com. This website offers technical lectures on "Civil Engineering" from personal field experience. Facebook fans 1,257. Twitter followers n/a. New Delhi, India About Blog The Blog for Civil, Construction and MEP Engineering-Structural, Finishes, Interiors, Façade, Landscape & External Development, Plumbing, Firefighting, Electrical, HVAC etc. My focus on the various topics of Engineering Materials, Specifications, Quality Control, IS Codes, Project Execution, Planning, Quantity Surveying, Estimating & Costing, Billing, Rate analysis, Budgeting etc. and Misc. Important Notes, Interviews questions & tips. Facebook fans 22,278. Twitter followers 1,422. About Blog Civil Engineer Blog and Forum on Civil Engineering Career and Construction Project Management. Facebook fans 198,772. Twitter followers n/a. About Blog This Website comprises all Civil Engineering Subjects.There are many good Websites on Civil Engineering Subjects,e.g. Theory of structure,RCC,Steel structure Design, Building construction, Roads,Water supply and sanitary engineering etc. seperately, but there is hardly any website covering all the Civil Engineering Subjects in one. Facebook fans 21,544. Twitter followers 33. About Blog RJN Group, Inc. (RJN) is a professional engineering and specialty field services firm providing sustainable collection system solutions for infrastructure owners. Established in 1975, RJN has earned national recognition as a professional engineering consulting firm and field services provider. RJN is ranked by Engineering News Record as a Top 200 Environmental Firm and a Top 500 Design Firm. About Blog Plant & Civil Engineer the premier publication for plant, construction, quarrying, agricultural & civil engineering industries in Ireland for almost 2 decades. Facebook fans 14,098. Twitter followers 2,511. Indianapolis, IN About Blog Wessler Engineering is a civil and environmental engineering firm, specializing in wastewater, drinking water, and stormwater projects, providing services ranging from master planning and design to construction administration and process energy audits. Founded in 1975 and based in Indianapolis, Indiana, we have branch offices in Evansville, Fort Wayne and Bluffton, OH. Facebook fans 234. Twitter followers 242. Norwich, United Kingdom About Blog Construction & Civil Engineering addresses the broad issues facing companies involved in the built environment. Facebook fans 10,766. Twitter followers n/a. About Blog Roads & Civil Works Australia is the country’s leading specialist road management, construction and civil works magazine. Roads & Civil Works Australia magazine is a leading resource within the Roads and Civil Engineering professions in local and state government sectors, as well as consultants and contractors within the private sector. Strathfield, Sydney About Blog ACSES Engineers is a specialist structural and civil engineering consulting firm with extensive experience in a broad range of project scopes. ACSES Engineers employs professional design & drafting specialists, dedicated to providing cost effective and practical solutions that surpass all expectations, by utilising the latest software, technical expertise. Facebook fans 2,454. Twitter followers 83. About Blog Learn about civil engineering,concrete technology,surveying,construction materials,construction Technics,all about civil engineering. About Blog Our goal is to spread a movement for better engineering and technology to help our society live a better life at a better and safer place, and fulfill their needs for faster growth. This blog is dedicated to knowledge sharing. The engineering and technology can excel only when there is a source of knowledge sharing. So, I've come forward, for the cause of better of civil engineering. About Blog Trimble's Civil Engineering and Construction is a leading innovator of productivity solutions for the heavy and highway contractor. Trimble's solutions leverage a variety of technologies, including Global Positioning System (GPS), construction lasers, total stations, wireless data communications and application software. Facebook fans 12,275. Twitter followers 816. New Delhi, India About Blog The No.1 hindi technical blog all over the world for civil engineerings branch in hindi. Facebook fans 2,711. Twitter followers 5. Faygate, Horsham, West Sussex About Blog Maltaward are civil engineering contractors offering a wide range of construction services & concrete barriers to both the public & private sector. Formed in 1981, Maltaward carried out Civil Engineering contracts throughout the South East of England. Facebook fans 9. Twitter followers 32. Houston, Texas About Blog Construction EcoServices is focused exclusively in the stormwater marketplace. Our business units provide solutions involving turnkey compliance assurance services, engineering sub-consultancy and cutting-edge stormwater management systems to all segments of the development, design and construction markets where those pursuits intersect with the rapidly evolving stormwater regulations. Facebook fans 85. Twitter followers 113. Santa Rosa, CA About Blog BC Engineering Group was founded by Thomas Billeter and a group of highly talented key staff to offer custom civil engineering and planning services to clients. The engineers at BC Engineering Group possess over 35 years of combined experience, which is a key ingredient for a successful engineering partner for your project. Facebook fans 94. Twitter followers 12. Kidlington, Oxfordshire About Blog Keith Cook Construction are Groundworks & Civil Engineering Contractors. Keith Cook Construction have been working with the some of the biggest names in the industry. Keith Cook Construction can offer anything from Labour only to Labour, Plant And Materials. 38. Mason and Stanfield, Inc.
Boise, ID About Blog Mason and Stanfield, Inc. provides comprehensive professional civil engineering services, surveying and land planning to the Boise area. Mason & Stanfield, Inc. is proud to be a respected and reliable civil engineering and surveying company in Idaho. India About Blog Through this blog Gurunath shares necessary Engineering information on Standards, Methods, Materials usage with brief description so as to create awareness and provide knowledge that is beneficial to professionals, Engineering students, fresh graduates, Non-technical and Common People impartially across the country. Facebook fans 255. Twitter followers 80. About Blog Website for Civil Engineers and Students. CivilDigital.com civil forum, engineers forum, civil doubts, civil engineering notes, civil engineering ppts, civil engineering seminars, structural engineering ppts, interview questons, multiple choice, objective, GATE preparation, IES coaching. Facebook fans 75,945. Twitter followers 3,992. About Blog Iamcivilengineer is a blog for civil engineers having huge number of books, softwares, excel sheets to download. Frequently updates, news and views. Facebook fans 22,188. Twitter followers 3,957. About Blog CivilEblog is a platform envisioned to be set for million of civil engineers and students across the world for quality information & blog articles on various topics related to civil engineering. CivilEblog is a blog where you can find quality news, articles and blog posts on various topics related to civil engineering. Facebook fans 182,084. Twitter followers n/a. Hyderabad, India About Blog Civil Scholar is a Civil Engineering Blog by Aravind Samala. Besides blog, Civil Scholar is on Youtube and Slideshare to share the Civil Engineering concepts with more interesting visual aids. Facebook fans 647. Twitter followers 3. Geneva, Switzerland About Blog The website aims to be a central platform for the industry to exchange best practices and learn about new ideas to the sector’s challenges. Platform to exchange leading practices and showcase construction innovation incl. Internet of Things, 3D printing or construction management. About Blog Information that is dedicated entirely to helping the civil user community maximize their use of Autodesk software. Facebook fans 181. Twitter followers 2,106. Rennes, France About Blog BatiScript: manage all the issues that occur in the construction industry through an innovative software on a tablet. BatiScript allows construction companies to enjoy having a software that increases their efficiency and productivity. Facebook fans 39. Twitter followers 62. About Blog This blog is dedicated to all engineers (and not only) that are using software solutions in their civil enginneering projects. GRAITEC is a major software developer committed to providing a highly professional complete CAD and Analysis solution dedicated to Structural Engineering and Construction, able to offer a complete suite of fully compatible and integrated state-of-the-art products. Facebook fans 3,111. Twitter followers n/a. About Blog This is a center to bring up and collect all knowledges and technologies flourished and flourishing to reach out for those who wish to acquire knowledge in a broader way. I am Anre, a structural engineer by profession and would like to share all information I have acquired all these years till date. About Blog thecivilengg.com website provides various information on civil engineering and its sub-disciplines via articles, videos, blogs and free materials like books. Facebook fans 25,168. Twitter followers 9,749. About Blog Grady Hillhouse is a professional civil engineer and hobbyist everything else in Austin, Texas. His goal for Practical Engineering is simple: to increase exposure and interest in the field of engineering. Facebook fans 903. Twitter followers n/a. About Blog J P Chick & Partners Ltd are Consultant Civil & Structural Engineers. Their commissions encompass a wide spectrum, from small domestic projects to large commercial contracts and developments. Their engineers are experienced at working as part of a team or as individual consultants. 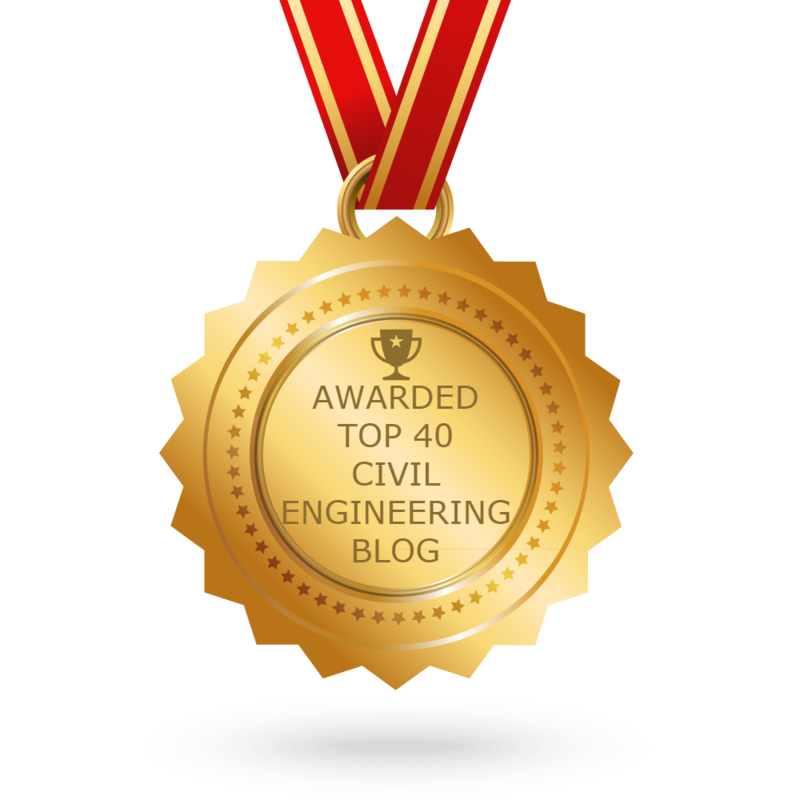 CONGRATULATIONS to every blogger that has made this Top Civil Engineering Blogs list! This is the most comprehensive list of best Civil Engineering blogs on the internet and I’m honoured to have you as part of this! I personally give you a high-five and want to thank you for your contribution to this world.